Depositphotos is a well-established stock photo agency and it's amongst the top companies in the market. With over a decade's history of great customer service, they offer a large library of royalty free stock photos and wide pricing options to fit in everyone's budget needs. 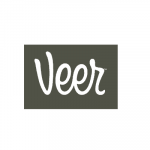 They sell images on demand with credit packs at $2,99 – $4,90 each. And they have even better prices with subscriptions: you can hire them monthly or annually, and there's different volume plans that let you get high definition photos for between $0,99 and $0,21 per download. Depositphotos is a very reliable and convenient stock photo agency, so you should definitely know more about it. Special for you. Register and get 5 free high quality images. After registration, your 5 free downloads will be added to your account automatically. Want to know what's hot in Depositphotos' library lately? 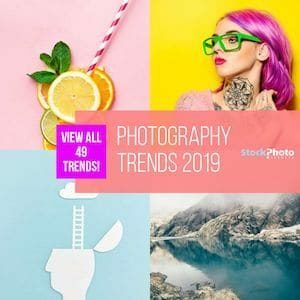 Then don't miss our awesome list of the 60 Most Downloaded Photos in 2018, including the 10 best selling images by Depositphotos and other 5 top stock photo agencies! Depositphotos is an established stock photo agency that offers a wide and very varied catalog of stock photos, vectors and more, at very cheap prices and with convenient buying options. This company was originally founded in Ukraine and later moved headquarters to the United States, and has been consistently among the top stock photo agencies in the space since their launch almost a decade ago. They have a strong international focus for their customers, and they are known for the quality of their customer service and their interesting bonus offers, free giveaways, and various perks for users. Try Depositphotos Free! Get 5 Free Images+ 15% Discount! Their approach is not very different from other stock photo agencies. Their highlight is their prices and buyer bonuses. Subscriptions and image download packs are inexpensive, and they are always working to make their site and services better. Searchable by: Categories (too many to mention) keywords, photographer, color, size, orientation, and two filters; adult content and licensing. Now they include reverse image search and other advanced features, of which you can learn in our Depositphotos Search Engine update. Depositphotos has made sure that their pricing sets them apart from other stock photo agencies. Image download packs and subscription options have a low buy in and make the price per image cheap, 22¢ to $4,90 for one image without size restrictions (up to HD). Depositphotos offers various subscription plans according to the volume of images you need and how much you are willing to invest. All their plans have a monthly and annual option, and they differentiate from other agencies because their annual subscriptions are billed yearly. All their plans have monthly download limits. 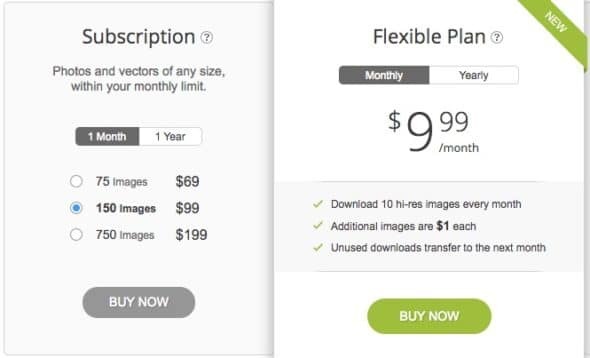 Lately they introduced their new Flexible Plan, an option for a very low volume of images (10 per month), but at super low price ($9,99 monthly) and with bonus discounts for extra downloads. Depositphotos has improved their search engine in the past years, and they now offer an advanced searching feature that includes keyword searching, filters, and image recognition technology for reverse image search. Their library is organized by categories in the most popular and sought after topics and styles, and all their images include relevant keywords. You can sort search results by best match, most sold or recent, as well as by file type and licensing status. Moreover, you can filter your findings according to category or contributor, you can exclude keywords too, and you can choose by accuracy, orientation, number of people, image size and even color. Plus, there's the reverse image search feature that lets you use any image you provide as search parameter to find similar, licensable stock photos. Learn more about Depositphotos' New Search Engine here. Depositphotos has royalty free licensing options including extended licenses. 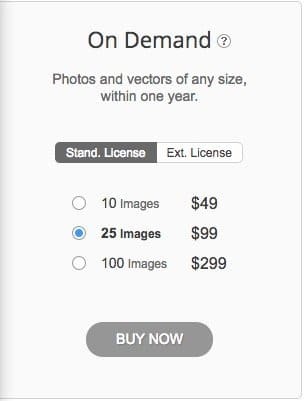 Extended licenses are sold under their own image download packs, starting at 1 image for $89. Previously they had different, stand alone licenses for each extended usage right, but now they have unified them into one Extended license that includes all the uses of the Standard license plus unlimited copies and use in items for resale or free distribution. They also have a multi-seat extended license available, for when you want more than one user accessing the account and the downloads. Licenses can only be purchased on demand only, with image download packs, and there individual price decreases the more licenses you buy at once. Their prices are very competitive for the market. They have a very useful licensing comparison board to help you determine which license you need. Check it out. Depositphotos is cheap. Cheap, cheap, cheap. They focus in appealing to the mass market by selling images for little and gaining through bulk purchases and high membership enrollment rates. 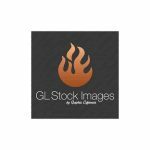 As a stock photo agency they are good, provide comprehensive information, bonus services, and work with their buyers and contributors to enhance their site. They are very well positioned in the market and after 8 years in business they are trustworthy as well. Try Depositphotos Free! 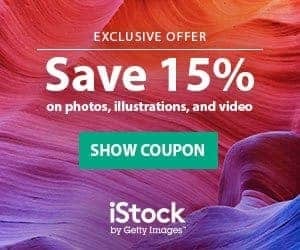 Get 5 Free Images + 15% Discount! There is nothing flashy or difficult about this website. It is all about pricing and buying options so that buyers will try them out. 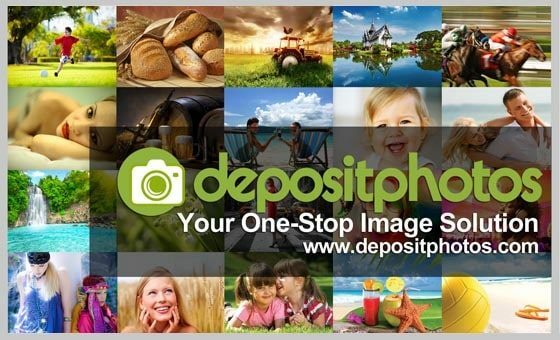 We have got our hands on a excellent Depositphotos Coupon Code which gives all our readers 5 free credits plus 20% off their next purchase.